Phone Hybrid Mix Minus ideas - Broadcast Audio Processing World! There are many Telos-type phone hybrids out there now. Many of which are in the ever increasing hands of free-lance personel. The proliferation of portable low cost / high quality mixing boards by companies such as Mackie Yamaha, and Sampson, (among many others) have become the standard in the free-lance world. Depending on your console’s design, you can achieve mix minus one of two ways. A modern broadcast console is equipped with two or more outputs. Typically they’re labeled “Program”, “Audition”, and “Utility”(The latter could be named “Mono”, or “Telephone”). The “Program” button (when activated) sends audio to the transmitter for broadcast. It is what the listening public hears. The “Audition” and “Utility” busses feed their own respective outputs, and are used for a variety of tasks. Usually they are used for “Mix Minus” purposes. If you are unfamiliar with “Mix-Minus”, read Telos Systems’explanation of this subject. These instructions are written on the assumption that you’ve decided to use the “aux send” output. If your board only has “Effects Send Outputs”, then substitute “effects” for the word “aux”. Some boards (such as the Mackie 1602) have 5 aux send outputs. We’ve assumed “aux 1 output” as the chosen method for feeding our Telephone Hybrid. The way your board is now configured, the telephone callers will hear any audio fed into the “aux send” buss. If your main microphone is connected to “channel 1”, the callers will not hear your voice untill you turn up the “aux send” control for channel 1. How do I find this control? It is usually located among the rows of knobs above the slider control. In the illustration below, we’ve shown for our example, the location of the “aux 1 send” control on a Mackie 1402 mixing board. If there are multiple microphones, or if you want to play a tape recorded message to the caller, just turn up the “aux send” control for that particular channel, and the caller will hear that (or those) source(s) in addition to your own voice. IT IS IMPORTANT TO NOTE that you should NEVER turn up the “aux send” control on the telephone channel! This will cause irritating “Darth Vader” like feedback to occur! Method 2 – The Quick And Dirty way! This scheme will work if your mixer has no “aux send”, or “effect send”, but does have a stereo “pan” or “balance” control. 1) Connect the telephone hybrid’s line input to, say, the right channel output of your mixer. 2) Connect the telephone hybrid’s output to the mixer channel you want to use for caller audio. 3) Connect your transmit feed to the left channel output of your mixer. 4) Turn the pan control for the hybrid all the way to the left. 5) Leave the other pan controls in the center position. Remember: the object of a mix minus is NOT to send the output of the telephone hybrid back to itself. We have instructed you to connect the hybrid line input to the right channel output of your mixer. 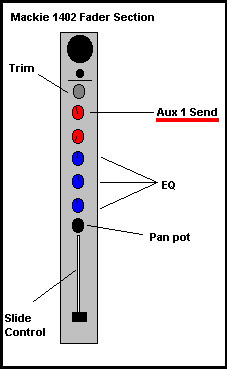 The pan control can place audio between the left or right channels. We had you turn the telephone hybrid channel pan pot all the way left. This means that the telephone audio is sent ONLY to the left channel (for broadcast). No audio is sent to the right channel (which feeds the telephone hybrid). Hope this clears some of the “fog”!